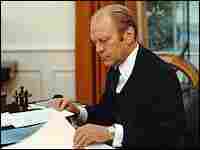 Presidents and the Constitution: Gerald Ford In the first of a series of conversations with former presidents about the U.S. Constitution, NPR's Cokie Roberts speaks with Gerald Ford, who took office when Richard Nixon resigned in 1974. In the first of a series of conversations with former presidents about the U.S. Constitution, NPR's Cokie Roberts speaks with Gerald Ford. He was the first person to assume the office without being elected president or vice president, rising to power after Richard Nixon resigned in August 1974.